I took a break from mass producing holiday cards to send out this week to make this love themed design for the current Paper Craft Crew challenge. The focal image is from Mama Elephant's Incoming Mail stamp set. I'd colored it last month as part of the Daily Marker 30 Day Coloring Challenge. I adhered it to a white circle with foam tape, then set it aside to put together the rest of the card. I edged a pale blue cardfront with a strip of red and white striped washi tape along the left side, then added a navy blue banner strip across the cardfront. The image panel was placed on top. For the sentiment, I stamped the teeny tiny "love you" from the Mini Messages set on a small circle. After matting it on a red circle, I adhered it to the cardfront, tucking it underneath the raised image. A trio of red enamel hearts scattered next to and above the image panel finished the sweet design. Absolutely adorable! Thank you for joining the Paper Craft Crew this week! 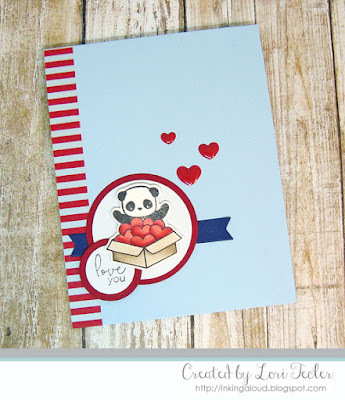 This little panda is so cute - and looks so happy at receiving a box of hearts! Lovely colour combination. Thanks for playing along with our Paper Craft Crew challenge this week. Lori, this was so precious and incredibly cute! I’m so glad you linked it to PCC for us all to enjoy! Congrats on being our top pick!